A pre-breakfast craft by the kids. We did this last year, and Emily remembered and requested it again this year. I cut out the shapes and little pieces last night and separated them in a muffin pan. When Emily padded into our bedroom this morning to ask for a movie, I groggily deflected her: "Hey, there's that pumpkin craft you've been asking for set out on the kitchen table. Do you want to do it before Kate wakes up (and eats the glue)?" Trump card! Off she went and I got a few more minutes of sleep before she returned to show me what she'd made. Crafting continued after Jenna and Kate woke up and joined in. What fun to watch Emily teaching Kate how to make a pumpkin face! I generally don't try to make everything deliberately educational but while they were working on this, it did cross my mind that this was a good exercise in recognizing and assigning facial features (the pumpkins and cats) and matching shapes (the candy corn). I did not supply a sample for the kids to "copy", nor did I tell them what went where - it was more interesting to watch them put the faces and pieces together on their own. Jenna turned some mouths into toupees and mustaches, which I loved. 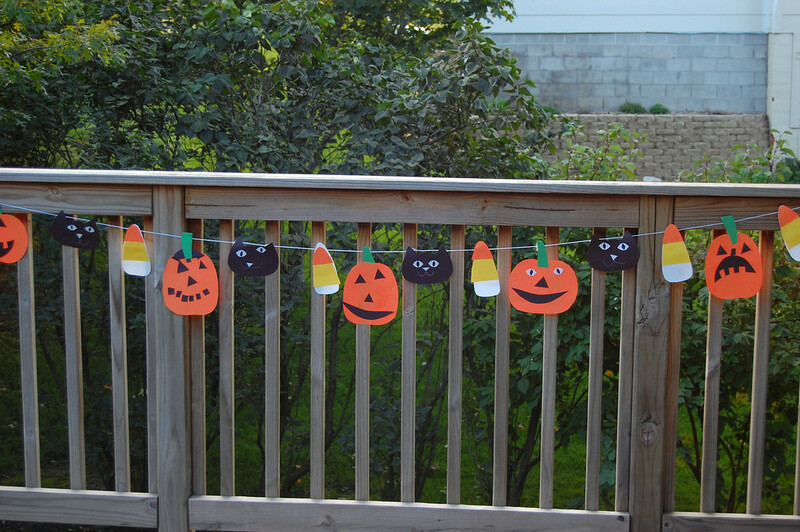 Incidentally, we reversed the candy corn colors to use the available paper scraps. I don't think the kids cared. 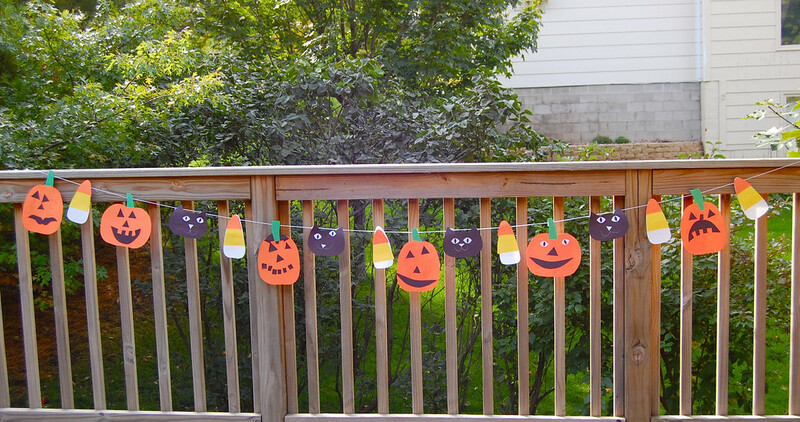 and hung them on the deck to take pictures. The garland is hanging indoors now where the lighting is horrible all year round. Here are some quick instructions to make this garland, although you can probably wing it on your own, clever people, you! 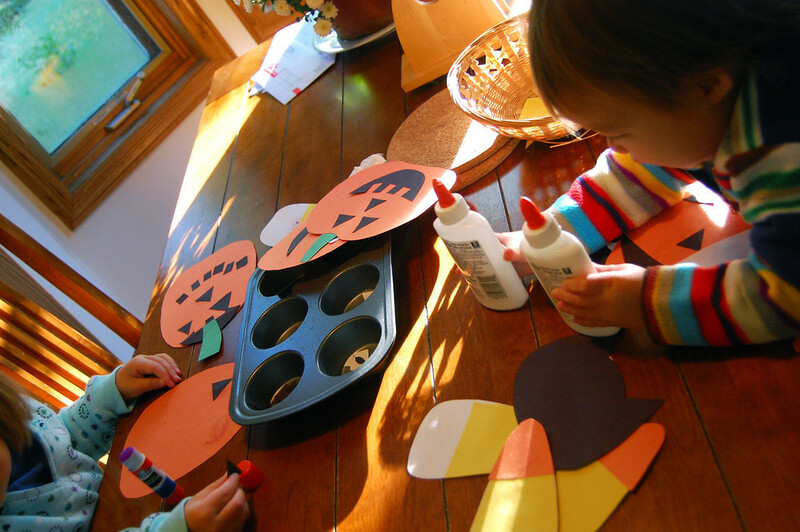 Cut pumpkin shapes out of the orange paper. Cut cat faces out of the black paper. 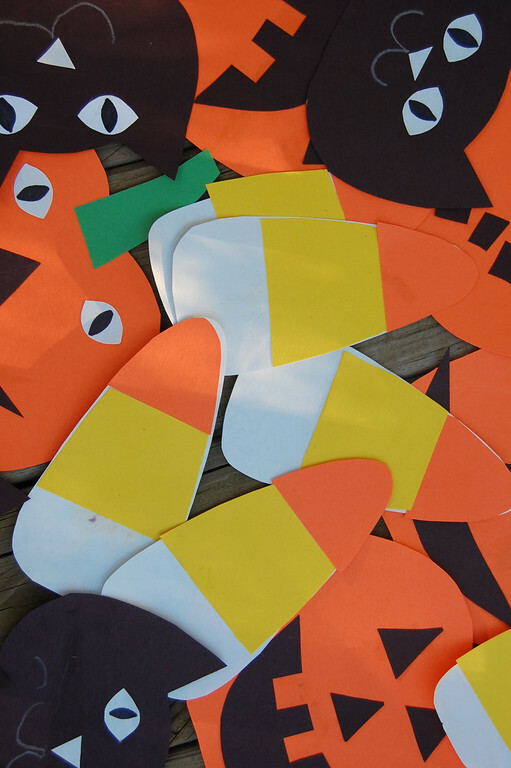 Cut candy corn shapes out of the white paper (or orange if you want it life-like). Cut mouths and triangles for the eyes and noses of the pumpkin, out of the black scraps. Cut the candy corn middle section out of the yellow paper. Cut the candy corn top section out of the orange (or white) paper. Cut cat eyes and noses out of the white paper. Cut pumpkin stems out of the green paper. Drew slit-pupils with black marker on the white cat eyes. Set out for kids to work with. Laid out the shapes right side down on a counter top, spacing them the way we wanted. Laid a long string across the tops of the shapes. Stuck tape on each shape where the string lay across it. me smile and get a little teary today. Adorable!! 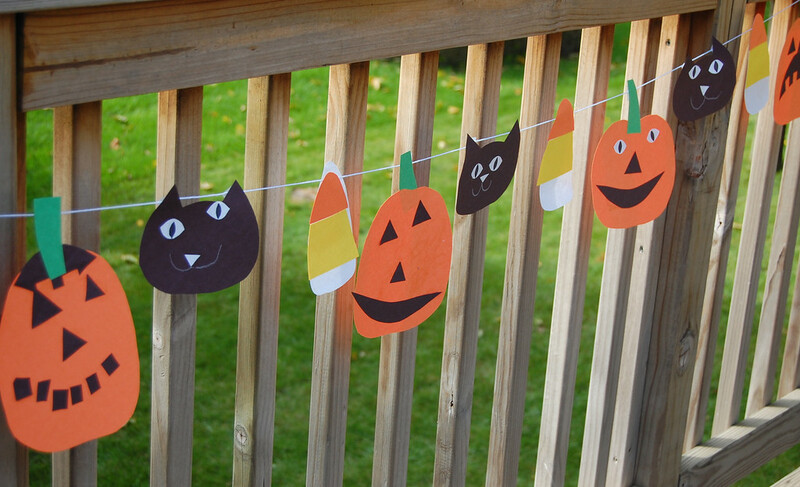 This would be super cute to make with your kiddos in felt then you could re-use it every year!! Yes, felt would be wonderful. I considered that because felt garlands are so lovely. But with Kate...and craft glue/needles.... hmmm. So had to use the safer alternative, pity. 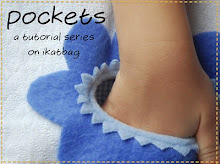 Super post, L. I think my girls will love this when I show them tomorrow. That is so, so cute you guys! How adorable, I love the cat faces best. Thanks for the fun idea, I'll be linking. I used your idea with my preschoolers! I put pictures up on my blog - lyndsayslovelylife.blogspot.com. 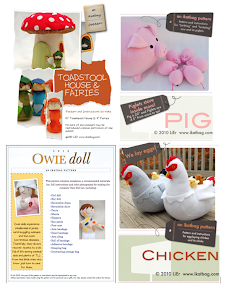 I sited that I got the idea from you, but I am new to this whole blog thing. Please let me know if I did it wrong!